And most importantly less curing time, again extending your casing life by exposing it to less heat, for less time. This new XT XTRATREAD Extension System arrives following substantial investment in technology, R&D, equipment and training. The XT XTRATREAD System offers significant life and cost savings to the end user and can provide up to 100% extended tyre life. 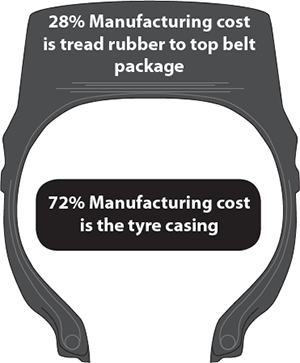 OTR tyre manufacturing costs are 72% casing and 28% tread rubber when worn to the top belt package. This cost breakdown demonstrates the importance of extending the life and adding value to your OTR tyre investment. Average tyre wear is approximately 80% tread utilisation. If you scrap your OTR tyre after one use you are throwing away 80% of its value. The XT XTRATREAD technology can add up to 100% additional life to your OTR tyres and will provide cost savings up to 24% on your tyre budget. So what is XT XTRATREAD? XT XTRATREAD is a revolutionary ground breaking technology developed to extend the life of OTR tyres and deliver major cost savings to your OTR tyre budget. The XT XTRATREAD technology allows us to rebuild your front tyre fitments with tread still remaining on them. Traditionally, casings for retread are generated from tyres that have been in service firstly on front positions (35% wear) and then on rear positions (65% wear). 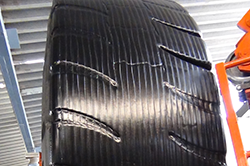 These tyres will have a significant amount of damage to repair, on the sidewalls, shoulders and crown. This has the potential to delay the finished product and means increased curing time, exposing your tyre casing to more heat and adversely effecting retread life. Using the XT XTRATREAD method we eliminate these problems and can double the life of your original tyre purchase, delivering major savings on your OTR tyre budget. The savings are easy to justify. The Tytec rubber we place back onto your new tyre is on average 50% cheaper than the cost of new tyre rubber. 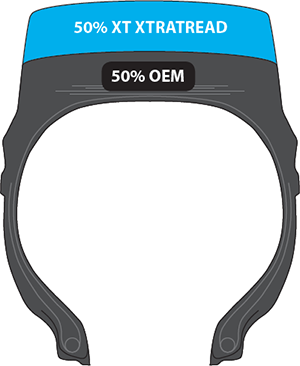 The more of our rubber you use the higher the cost savings. XT XTRATREAD OTR tyres have proven performance in mine sites across the globe. A New front tyre at 50% tread has it’s first XT XTRATREAD treatment, rebuilding the tyre to 100% tread. The tyre can be returned to front or rear of position. Depending on the tyre casing condition the XT XTRATREAD treatment can be repeated making for a 100% extension of your tyre life and saving millions of dollars on your tyre budget.